“And in a single day and night of misfortune all your warlike men in a body sank into the earth, and the island of Atlantis in like manner disappeared in the depths of the sea” (1). The myth of Atlantis is one of the oldest tales of mankind; the story of a great utopia swallowed by the sea. Over time, many connections have been made that suggest the Greek island of Santorini was once the flourishing city of Atlantis and that it was the island’s most recent volcanic eruption that led to the rapid disappearance of this fabled civilization. The first written account of Atlantis was brought about by the Greek philosopher Plato in his Critias and Timaeus. In these dialogs, Plato refers to Atlantis as a circular island consisting of concentric rings and surrounded by great walls of stone. Plato paints the picture of an advanced island civilization banished into the sea by the power of Poseidon: the “Shaker of the Earth”. In what was described as a single day and night of misfortune, great earthquakes and floods sank the city of Atlantis into the sea (1). 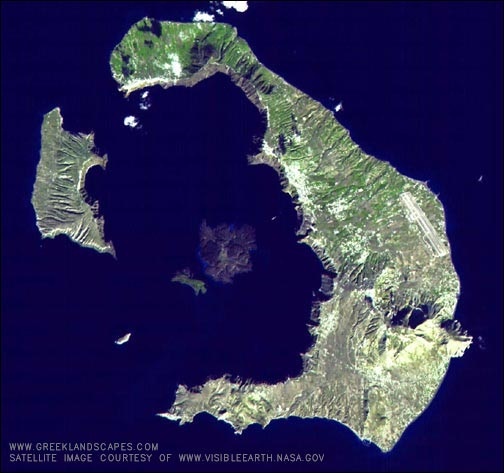 Prior to the volcano’s most recent eruption, the Minoan eruption dated 1613 +/- 13 BC, Santorini had similar geography as today and was home to a civilization rich with culture and technological advancement (1). 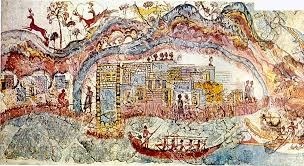 An elaborate fresco uncovered in the excavation of Akrotiri on the main island of Thera depicts Minoan Santorini as being very similar to the description of Atlantis presented by Plato. The ships fresco of Akrotiri, an important connection between Minoan Santorini and the myth of Atlantis, portrays Santorini as a round island surrounded by a ring of land with access to the sea. Excavations in Akrotiri skyrocketed the interest of archaeologists towards Santorini as a candidate for Atlantis. In 1969, Galanopoulos and Bacon published the book Atlantis in which they discuss their theory that the Minoan civilization of Santorini was actually the fabled utopia of Atlantis. Galanopoulos and Bacon’s approach to connecting Santorini with Atlantis was unique at the time because they used geological evidence to support their theory. The authors explain the red, white, and black rocks mentioned in Plato’s dialogs as evidence that Atlantis was a volcanic island. They also connected the concentric ring system used to describe the Metropolis of Atlantis with the features of a nested caldera: a kind of collapse feature that can occur after a large explosive eruption. 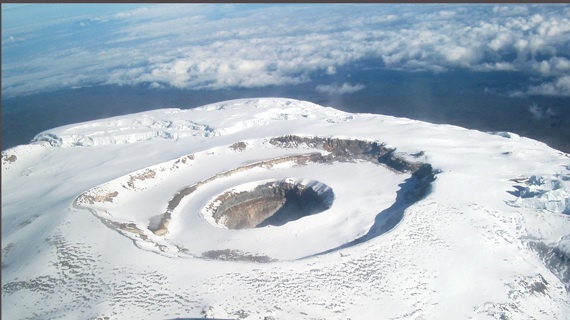 An example of a nested caldera can be found on the African volcano of Kilimanjaro. Galanopoulos and Bacon also cite Plato’s account that the sea around Santorini was inaccessible after the event due to an abundance of “mud” in the water as evidence that pumice from a volcanic eruption surrounded the area, just as it would have after the Minoan eruption of Santorini. Although theories of Santorini’s connection to Atlantis have continued to develop over the past century, no one can say with certainty whether or not the island was once home to the ancient utopia. While the lack of evidence prevents archeologists from establishing a concrete conclusion, the myth of Atlantis continues to a popular addition to the history of Santorini. (1). Friedrich W.L., 2009, Santorini: Volcano, Natural History, and Mythology, Denmark: Aarhus University Press, 312 P.
Take it easy on the wine, Bugged or not Bugged. You chose a great cover image for your blog post. It provides a great entry into your story. From what I remember from my mythology lessons, it wasn’t Friedrich who said that “But afterwards there occurred violent earthquakes and floods; and in a single day and night of misfortune all your warlike men in a body sank into the earth, and the island of Atlantis in like manner disappeared in the depths of the sea.” It was Plato, yes? If you contextualize the quote, it’ll be easier to understand the mythological significance of Santorini. Tell us a bit about Plato (who is he, where does the quote come from, when did he write, why did he think that Santorini is Atlantis)? You bring up Plato a bit later in your entry; just make sure you push some of the information to the front. I’d also like to know more about Galanopoulos and Bacon. Why would they be authorities in the field? In other words, what’s their ethos? And, now that you have experiences being in Santorini, how do you understand the history of the place? Can you imagine an “Atlantis”? Are the geological findings strong enough to corroborate the possibility of Atlantis as more than a mythological tale? Thanks for showing us the connections between mythology and geology in your post. I hope to read more on it. I really like that you did your post on this topic because I definitely wouldnt have thought of that. I had an “OH SNAP” when you made the connection that the story could have been mistranslated when it was translated to Greek. This is a really cool idea. Atlantis was one of the coolest selling points for this abroad trip to me and I’m glad you covered it! I heard bits and pieces of the evidence supporting the Atlantis-Santorini theory, but this article is great for tying them all together and providing sources for the information. Cool fact about the nested caldera and props for providing a current day example in Kilimanjaro! If you have a chance, I’d like to know a bit more about how the ancient civilization was technologically advanced? Yes, it was Plato who said the quote at the beginning of my article! I took the quote from our textbook so I was unsure on how to cite the material, but I agree it would have made more sense to cite the original dialogs. Thank you for your comments! Alex- We know from the excavation at Akrotiri that the Minoans ( whether they were truly Atlantians or not) were highly advanced in their technology and had produced an efficient plumbing system, market economy and international trading route before the eruption ceased their development. Thank you for asking! Previous Previous post: Akrotiri; Doomed for Destruction, but When?